Andrew Breitbart at the Americans for Prosperity Defending the American Dream Conference. Photo by Mark Taylor, via Flickr. What does this have to do with the recent sudden death of BigGovernment.com’s scorch-and-burn blogger Andrew Breitbart? Everything. Breitbart made his living by seeking to destroy the lives of other human beings whom he had identified as “traitorous” or “dangerous.” He would be the first to proudly own that. He seemed fine with the dubious morality of his chosen vocation because he clearly felt completely righteous about it. If someone (on the political left of him) said or did something that had the slightest hint of questionable ethics, Breitbart was right there, putting the person under the world’s largest magnifying glass, using character assassination and guilt-by-association to link his target to every political crime and criminal of the past half-century, and beseeching Americans to be vigilant in holding said person “accountable” lest they take down America and our way of life. But the irony is that it was Breitbart and those who mimic his ethically boundary-free approach to political conflict that are the real threats to (what I hope are still) American concepts like dignity, decency and basic civility. Although Breitbart took several swipes at me personally, calling me a “moron” and “libtard,” amongst other things, and also viciously and publicly tried to derail the career of a dear personal friend who is one of the most deeply compassionate people I have ever known, my distaste for Breitbart was much more general. I know it violates some conventions (perhaps even in my own field of nonviolence) to say this out loud, but I cannot honestly find anything about Breitbart’s public work that made the world a better place. That sad realization has given me serious pause to think about my own legacy and how I engage those with whom I have serious disagreements. In my work on civil resistance, I consistently remind nonviolent actors not to use any tactic or approach that they would not have used against them. Can I honestly say I have applied that same logic in my own personal dealings? I’m not sure. If I’m being totally truthful, then probably not. That scares me. I don’t want to someday go out like Breitbart, with a dubious legacy that said yes, I had an impact, but at the expense of my own self-respect and perhaps at the expense of human dignity itself. So perhaps we can make lemonade out of the many lemons Andrew Breitbart left lying around. Maybe there is an important lesson here about raising the level of discourse. About treating people with basic dignity. About civility and its relationship to a healthy society. About entering into a social contract whereby we—specifically those of us engaged in political conflict—agree not to seek the destruction of the life of a human being with whom we have even serious disagreements. Especially if we have serious disagreements. I extend my sincere condolences to the family of Andrew Breitbart, and especially to his children, and I hope my words don’t add to their suffering in any way. That is not my intent. I respect the fact that if nothing else, Breitbart lived his work out loud, and I have to believe that he would respect an honest remembrance in kind. But Breitbart’s death is also forcing me to remember that our time on this planet is short and that we ought to be pretty careful about how we choose use it, lest we risk being remembered in a way that does not do justice to the better angels of our natures. 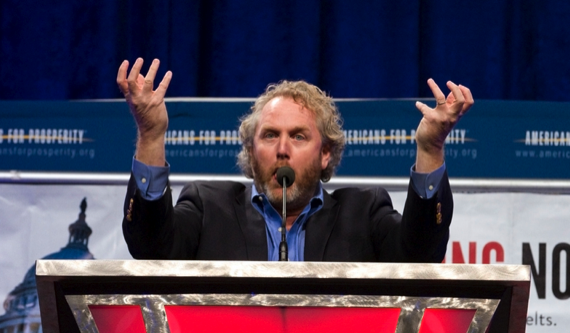 For that reminder and to the challenge it presents me personally, I extend my gratitude to the late Andrew Breitbart. And I will try to do better. Dr. Cynthia Boaz is assistant professor of political science at Sonoma State University, where her areas of expertise include quality of democracy, political development, nonviolent struggle, civil resistance, and political communication and media. She is also an analyst and consultant on nonviolent action, with special emphasis on the Iran and Burma cases. Dr. Boaz is also a contributing writer and adviser to Truthout.org and associate editor of Peace and Change Journal. YES and very well said. So let me get this straight. Liberal democrats can say the most outrageous things about conservatives but when a conservative does the does something similar (true or not) we should go out with pitchforks and torches looking for blood? Maxims Waters has called the tea party and conservatives the most vile things under the sun, Bill Maher even worse. But that’s okay because its all true right? They shouldn’t be censored, removed from the airwaves or god forbid apologize for their hatefull remarks because its for the greater good. Did you read the article? I say just the opposite of what you claim I say. You actually agree with me completely. So, thank you! We all need to practice good communication skills, Kharn. That includes careful reading and listening. I hope you prayed for Andrew Breitbart that he didn’t fall out of the boat that was ferrying him across the River Sytx. Why, instead of attacking the people, aren’t we dissecting the issues? I have ceased to be labeled as supporting either political party, which has broadened by scope of understanding and of being heard by others. *my understanding, not by understanding.